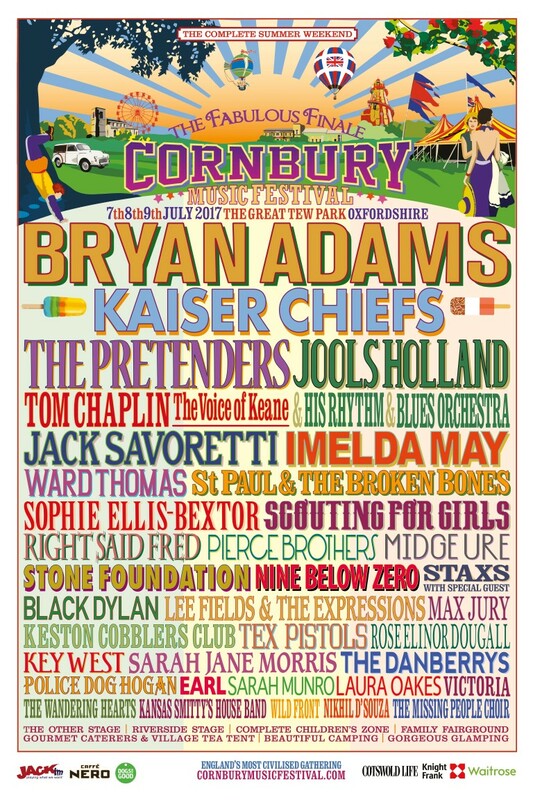 We were absolutely thrilled to be invited to Cornbury festivals‘ fabulous finale! We went there two years ago when I was working in the craft tent and had an absolutely brilliant time and so were really excited to go again. 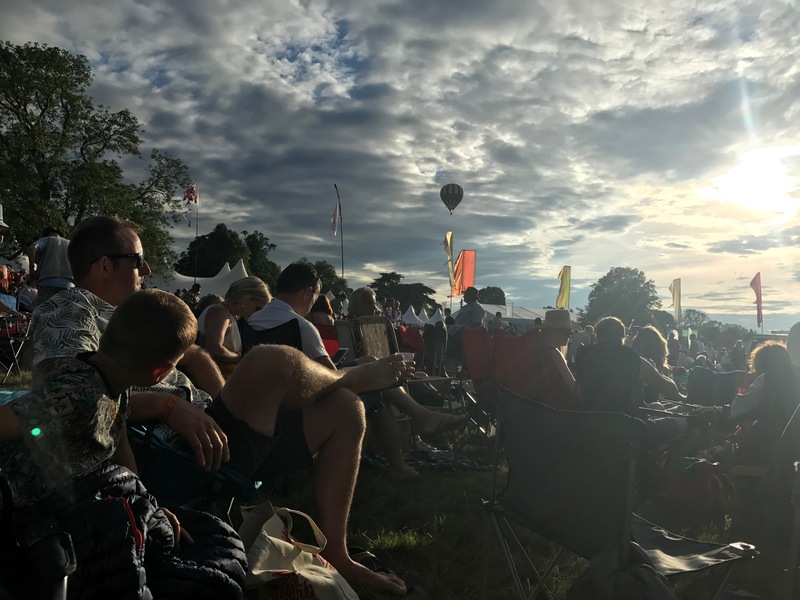 The weather forecast was looking good and we were all in good spirits as we set off for Great Tews park, one of the most beautiful settings for a festival, perched in the rolling Oxfordshire hills, a vision of quintessential English countryside. The amazing line up for the festival! 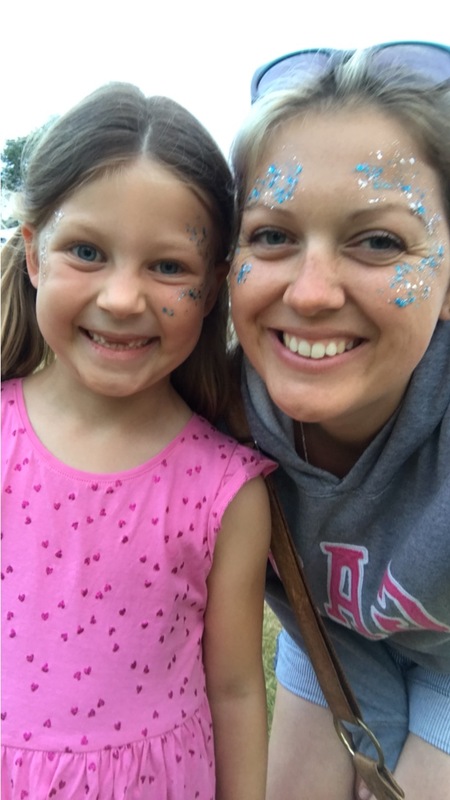 We traveled up on the Friday after school and work and smoothly entered the festival with no queues at all and set up Wilma the campervan quickly so that we could get in and enjoy the festival. We arrived at the stage in time for Sophie Ellis Bexter’s set and it was nice to hear some old favourites and have a sing along. The kids were exhausted (translation for ‘no fun at all!’) and so we just had a little stroll round before finding a spot to listen to the amazing Kaiser Chiefs. They were so so so good! All the songs from my going out days were played and took me right back to a time of carefree fun and nights out…. the kids soon dragged me back to the present though, and we had to leave half way through the set, listening to the epic ‘I predict a riot’ from the van as they were just too tired to go on! 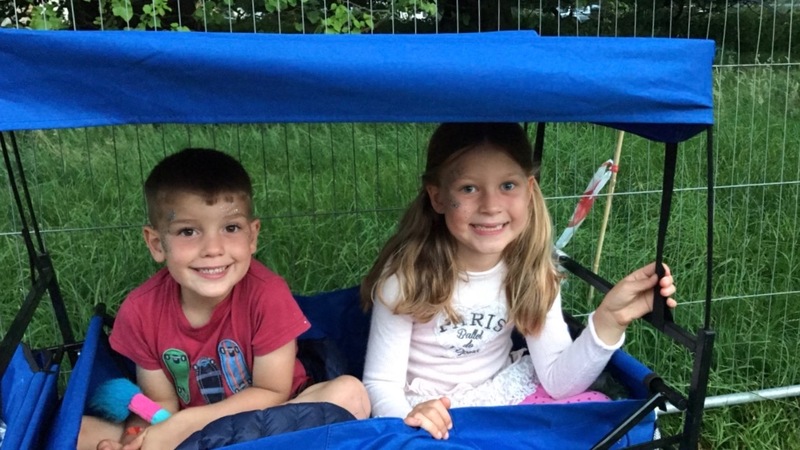 The only way to travel if you are a child at a festival! Having the best time @Cornbury the @KaiserChiefs absolutely rocked it last night. Kids were up late&up early though, I predict a riot today! A post shared by Louise Pink Pear Bear (@pinkpearbear) on Jul 11, 2017 at 11:59am PDT After tracking down bacon butties (the hubs and kids) and a delicious smoothie (me, aren’t I good?!) we settled down for a bit and listened to a couple of bands, Victoria, who were fab, and Black Dylan, who were also really talented musicians but the lead singer did a little more talking then singing, which would have been fine had it not been for the fact that it was 1pm, full of kids and everything he said was peppered with swear words! They should really have checked the set list and put them on a little later considering one of the songs seemed to be titled ‘Papa is a Mother F**cker’!! 😀 It did make us laugh but really annoyed a lot of people and prompted a chant of ‘off, off, off’ resulting in the compare later apologising for his terrible ‘potty mouth’! Luckily one child was asleep and the other not really paying attention. 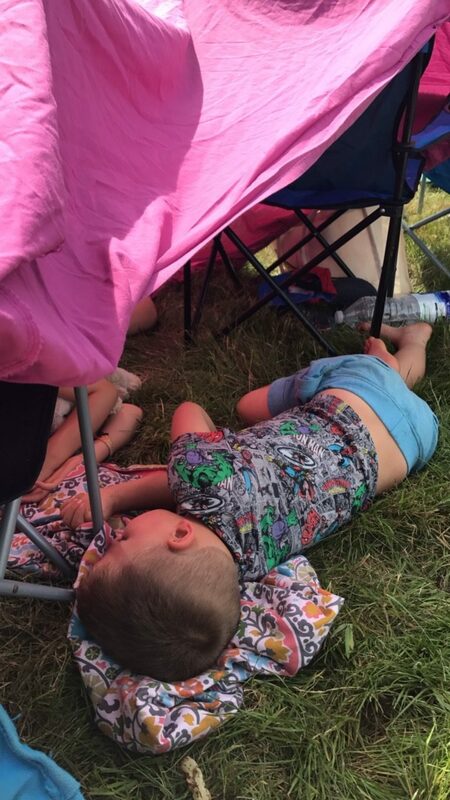 It was ridiculously hot, one of the bluest sky days I’ve seen in a long time, and the area we were sitting in was very sparsely shaded and so I popped back to the van to get our fitted double sheet from the bed and we made the kids a makeshift tent by placing it over two camping chairs and they sat and napped in there for a bit in the cool shade. I congratulated myself on my genius for this one and was feeling pretty smug about my ‘making do’ ability. I had also been surprisingly (usually!) organised and had packed a picnic, which we ate before heading over to explore the fabulous kid’s area. This is always the best part for me. They always put so much effort into these and there were the usual circus skills, crafts and clay making along with science shows, Time Travelling Toby, (an old favourite of both kids), and no end of quirky live acts wandering around captivating and delighting the kids. We saw a giant fairy on stilts sprinkling glitter, a dragon and his medieval owner and a giant animal that looked a little like the creature from never ending story being led around by two mythical beings. Jem (or Thomas Trilby!) does a fantastic job of bringing everything together. Nothing like a bit of chilled out reading time at a busy festi. They were enjoying one of the Time Travelling Toby books we bought after seeing the show. 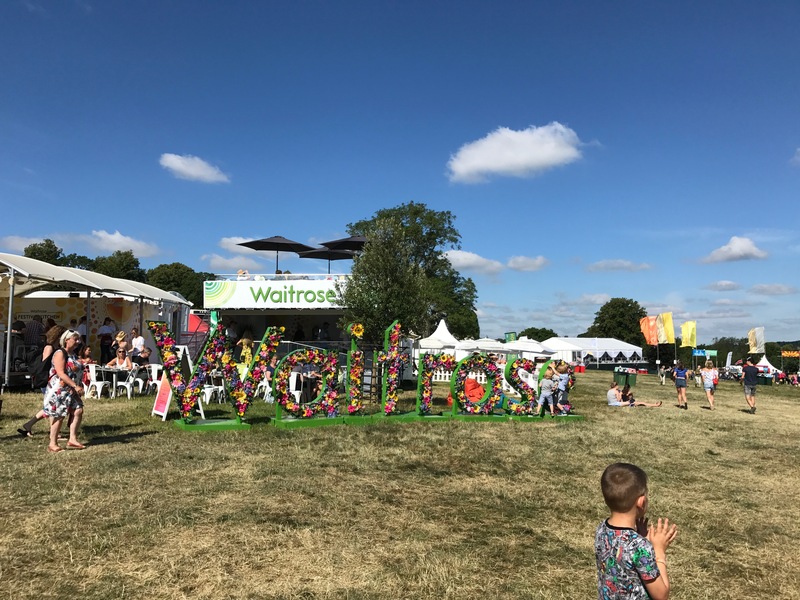 We also strolled over to see the Dogs for Good stand to make some fun doggy masks and learn a little more about the wonderful work that they do and of course to pet the many labradors! They had a show running several times over the festival but unfortunately we timed it wrong each time and so didn’t get to see it but heard that it was a brilliant insight into how they train the dogs to be such amazing companions. Loving the flowery Waitrose cafe sign! It really is one of the fanciest festis we’ve been to! After that was some play time near the Disco Shed, which I absolutely love, chilled out tunes in the day and then a real party atmosphere at night! There were a few swingballs and giant jenga set out and we sat and chatted in a shady spot while the kids made friends and ran about playing. A little while later, despite having a hat on, sun cream and trying to keep her in the shade and really well hydrated, my daughter felt really unwell and very sick and so we took her to the first aid tent where they looked after her brilliantly, checking her temp, getting her some cold water and a cool pack to put on her neck. They were really nice to her and made her feel a lot better. When she was up to it, we headed back to our chairs to get her some dinner, (anyone else spend their entire time at festis eating?! 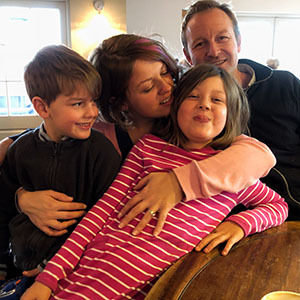 ), and my son and I queued for the longest time for wood fired pizzas, luckily getting to listen to the amazing Tom Chaplin formally of Keane, who was refreshingly honest about his struggles and why he was no longer with the band. He sung beautifully and there was some of his new solo material as well as some classic Keane numbers that I could amuse my son by belting along to! Police Dog Hogan were also a surprising hit, very funny and excellent musicians, we didn’t think they would be our cup of tea but we really enjoyed their set. The pizzas were just what we needed and we snuggled down to wait for Bryan, watching the hot air balloons going up and the sky changing to a beautiful sunset. It really was quite magical. It really was amazing watching hot air balloons go up right next to the main stage, one after the other they took off into the sunset. Must have been a magical experience for all on board. The main event was deservedly Bryan, and as his set started, everyone around us jumped to their feet, I knew more songs then I realised I did and the icing on the cake was when not one but both kids fell asleep snuggled on our laps and we could just enjoy the music with no whinging, moaning, wriggling or the incredibly silly behaviour that results from tiredness in our house! As the evening drew to a close, some of our ‘neighbours’ helped us to collect up our (many!) bags and we put the kids into the trolley….best thing evvvvvveeer….and headed back to the van on a really happy high. Although it was another stunningly beautiful day, we headed off early on Sunday, there had been a mix up with us bringing the van and we had been told on arrival that the camper area was totally full so we were asked to set up in the main car park which was fine but meant a bit of a trek to the toilets and no showers so we decided to get home and clean up so we could go and pick up our new puppy a bit earlier. It wasn’t really a great hardship, as we were so excited about puppy day, although it would have been nice to see a little bit more as the line up looked brilliant again. 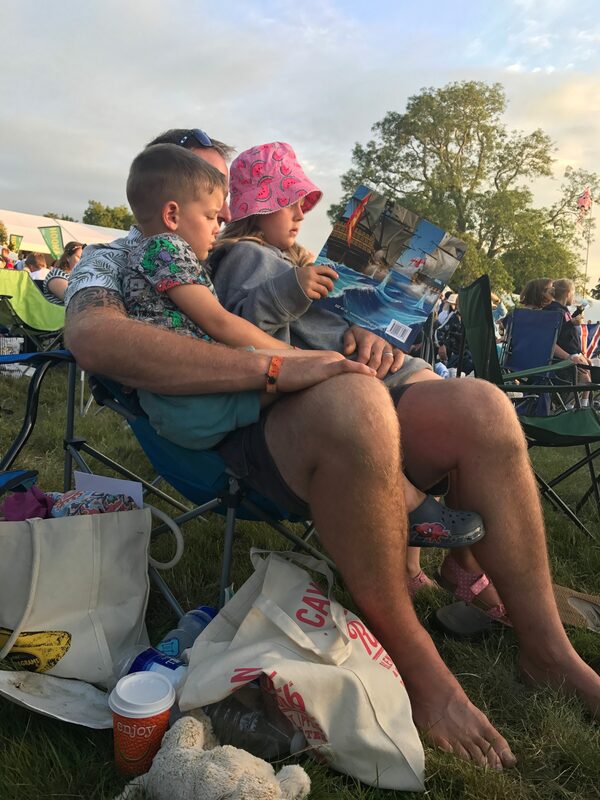 All in all, Cornbury was a massive hit with us all and I personally think that it is one of the best festivals that we have been to as a family. I hope that one day it comes back, it is such a great shame that that was the last one when it seems to me to be such a huge success.